German public broadcasters ARD and ZDF tackled the 2018 FIFA World Cup with a small team of roughly 15 technical people located at the IBC in Moscow and working with a team of more than 300 back home in a temporary 3,000-sq.-meter facility at SWR in Baden-Baden that houses a studio, two production-control rooms, and 11 Avid editing suites. 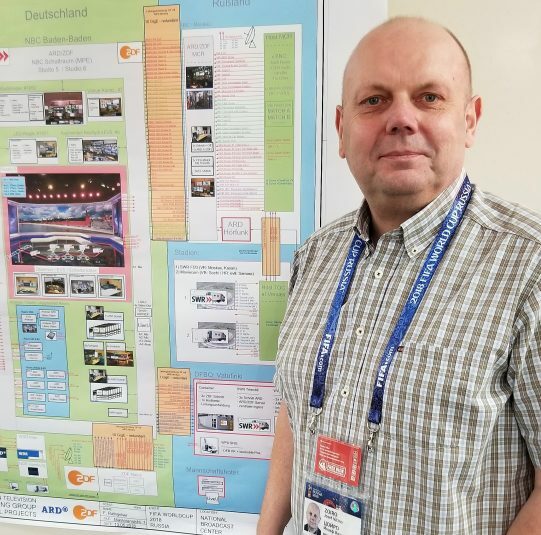 ZDF’s Vitino Zoiro is overseeing German operations at the World Cup IBC in Moscow. The presence in the IBC also reached out to the stadiums for German matches during the Group Stage. ARD and ZDF had their own OB unit in Russia, renting additional equipment from Russia’s Movicom when Germany played matches in Moscow and Sochi and it was too difficult to get the remote-production unit from one location to the other in time for the match. ARD and ZDF also had eight ENG crews traveling throughout Russia, using eight LiveU transmission systems to send content to a LiveU server in Baden-Baden. Cologne-based Qvest Media played a key part in the effort, providing rental gear for everything from the ENG crews to the temporary facility in Baden-Baden. ENG gear includes Sony PXW-Z450 and PXW-FS7 MK II camcorders with Fujinon lenses, Sennheiser microphones and radio links, RØDE directional microphones, Sachtler tripods, and other grip equipment from ARRI, Chrosziel, Bebob, and Quickpole. “The content is sent directly to Germany, where it can be edited in the Avid editing suites,” says Zoiro. Only two edit suites are located at the IBC, with two 10-Gbps circuits used to send all the needed content to Germany for final production and distribution. File transfers also are used to get content back to Germany. The German broadcasters’ facility in the IBC keeps a sharp eye on signal transport to Germany. The highlight in Baden-Baden is a studio with a large LED screen that can be broken into strips or used as a single screen measuring 11 sq. meters with a 1.6-mm dot pitch. A production team from ARD/ZDF visited Russia in May and used an 8K camera to shoot backdrops that can be displayed on the screen with maximum image quality. Qvest also provided the EVS gear at Baden-Baden — including IPDirector, XTAccess Ultra Performance servers, and XT4K servers — and 480 TB of Avid Nexis E4 shared storage. The storage equipment is tied to eight Avid editing systems owned by ARD and ZDF and 10 extra Avid Media Composer stations based on HP Z8 workstations with the Avid DNxIQ I/O interface provided by Qvest. For audio postproduction, ARD and ZDF had already invested in two Pro Tools Ultimate systems, including Avid S6 consoles, for the 2018 PyeongChang Olympics. These are now also being used for the World Cup. For format conversion, the public broadcasters rely on Kudos equipment from SAM. UHD/HD conversion is done by an AJA converter. 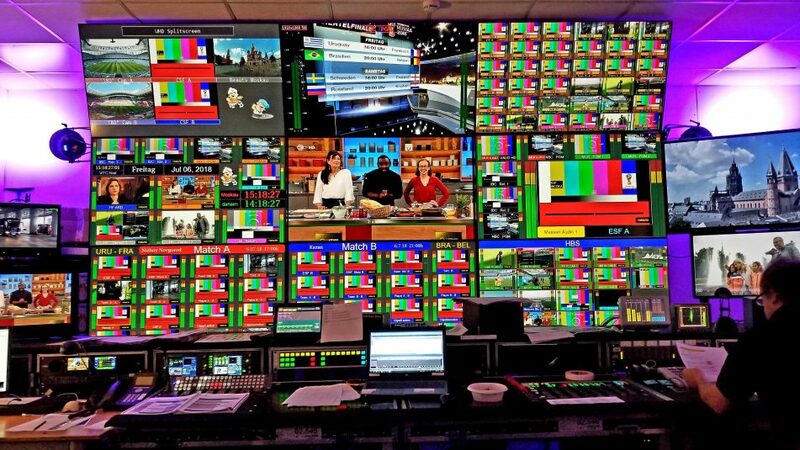 Qvest Media also complements the video-monitor walls in the central studio in Baden-Baden. Evertz VIP-X multiviewers are used for the interaction of the displays. Qvest ensures an efficient system configuration for the numerous workstations by means of an additional KVM matrix, including workstation modules manufactured by Guntermann & Drunck, which supplements the ARD and ZDF gear. There are two control rooms in Baden-Baden. One is used for the studio production. The other handles the LED board, which requires deltatre augmented reality to be integrated with the five cameras. “It makes no difference if the studio is here or in Baden-Baden,” says Zoiro, noting that, at matches, the production team takes advantage of flash positions and standup locations.